This beach ranks #6 of the "Best beaches in Tahiti island"
Tahiti Surf Beach Paradise is a three star hotel with room's rates starting from US$130 per night. This is an excellent option in a quiet place far away from the crowds. Fly to Tahiti International Airport (PPT). Next hire a taxi or take a bus. But the best is to take a rental car, as the place is located far from it all. 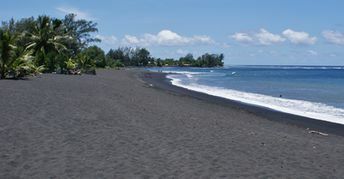 The best time for a beach holiday in Taharuu is a dry season from April to September.